I'm so excited today to tell you about one of the books I read over the holiday break! 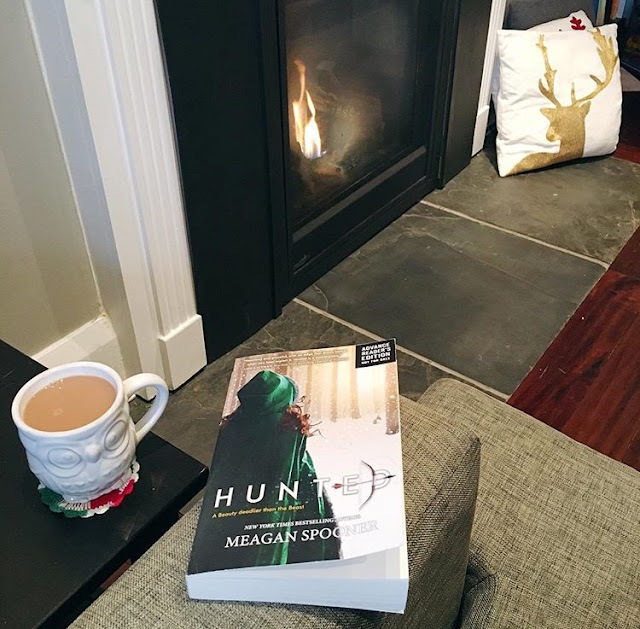 Hunted, by Meagan Spooner, is a dark and twisty retelling of Beauty and the Beast. After her family loses their estate, Yeva, whose childhood nickname was Beauty, her sisters and her father are forced to move into a hunting cottage at the edge of town. Her father tries to hunt for them, but after he fails to return one day, Yeva sets out to search for him. Unfortunately, she is captured by the Beast who is certain that Yeva is the key to releasing him from his curse. When it comes to books that are fairy tale retellings, I have high expectations. Classics are classics for a reason. Especially one like Beauty and the Beast that is in the spotlight this year because of the upcoming movie. In Hunted, I think that the author did an excellent job of retelling a story we all know well and adding in other elements to make it unique and captivating. Interwoven into this Beauty and the Beast story is also the Russian fairy tale "Tsarevitch Ivan, the Firebird, and the Gray Wolf." 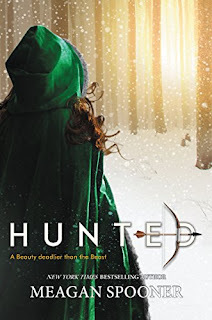 Yeva is a strong character, and her connection to the Beast is not Disney-fairy-tale-like in any way, which I really appreciated as a reader. I think it's important to acknowledge that your readership knows a complicated relationship when they see one, and that making love overly simple will be a turn off. Most of this book is told from Yeva's point of view. Then, after each chapter, we read these beautiful, short, haunting pages told from the Beast's perspective. You see his character's evolution and struggle as both man and beast throughout the novel. And don't be concerned like I was when you see Hunted #1 as a title online. I was worried there would be a cliffhanger ending, but that's not the case. I am curious where the story will go next though if a Hunted #2 coming our way in the future! The parallel themes of being taken to an unfamiliar, predatory world, as well as a heroine's inner struggle to both provide for her family and forge her own path will ensure that fans of Sarah J Maas' A Court of Thorns and Roses enjoy this book. Yet, the worlds created by Maas and Spooner are also different enough that they are certainly each their own story. Hunted is available here on Amazon. You can also connect with Meagan Spooner on Facebook, Twitter, Tumbler, and her website. PS - My beautiful Beauty and the Beast bookmark is from Lexy Olivia. Disclaimer - I received a copy of Hunted courtesy of HarperCollinsCanada. All thoughts and opinions are entirely my own.